Now that Epic Mickey's done, Warren Spector has moved onto yet another, Disney-based, project. However, the man isn't working on a game, he's writing a comic based on the popular DuckTales animated series. The new series is going to be published by BOOM! 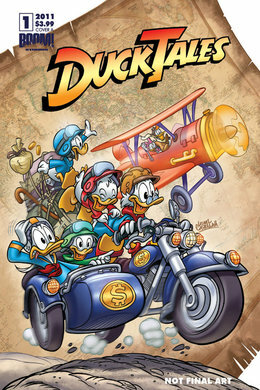 and will feature artwork from iconic Disney comic artist Miquel Pujol. The cover image at right looks pretty epic, and it features just about every character from the cartoon (though Gizmo Duck is noticeably absent). According to the comic publisher's marketing chief Chip Mosher, "We're taking you back to one of the most celebrated Disney Afternoon series ever aired! And with a creative powerhouse like Warren Spector and fantastic art from Miquel Pujol, this series is sure to be jam-packed with duck adventures no DuckTales fans will want to miss!" This comic project isn't a huge surprise, seeing as how Spector has admitted his love for both the cartoon and the old Capcom platformer, but it's still exciting, especially after how Disney Interactive hit Junction Point with a round of layoffs last month. Hopefully this new comic series will lead to a new game for the studio, but I'm happy with this kind of baby step.